Drizzle some olive oil in the bottom of skillet. Cook veggies until almost done. Drizzle a little more olive oil, if needed. Add chicken pieces and taco seasoning. If you can, try not to crowd the chicken so they brown more than steam. An even better idea would be to grill your chicken in large pieces and then cut up into chunks and move to the next step. Add rice to cooked chicken and veggies. Simmer for 12-15 minutes or until rice is cooked through and liquid is absorbed. You can start off with the lid on and take it off to the end if it needs to boil some of the liquid off or or you can start with it off and end with it on. You need to watch your liquid and add as needed or take a little longer to cook it off. The heat of the fire and how juicy your salsa is determines your cook time. When your chicken, rice,and liquid are perfect stir in your beans and corn. Allow a min or two for them to heat up. Turn off heat. You can sprinkle your cheese over the whole dish now and replace lid to melt or let everyone add their own cheese to their own dish. * Not all instant brown rices are created equal. My rice/water ration is 1 cup rice to 1-3/4 c liquid. 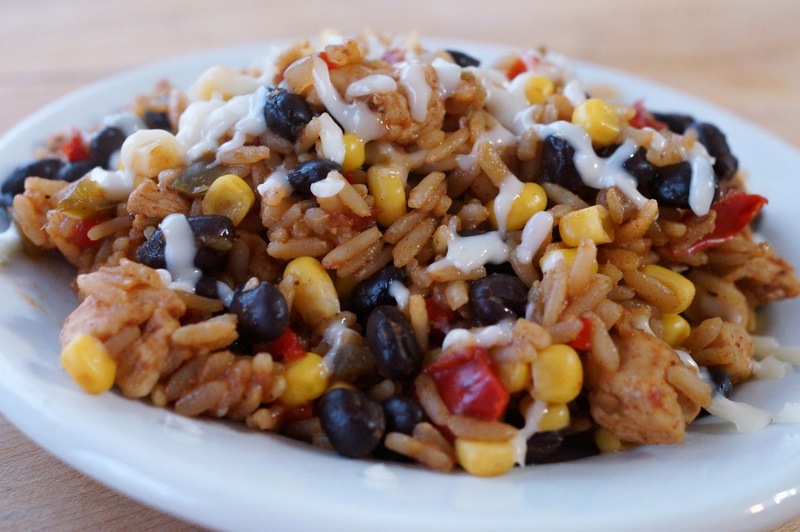 You could cook your rice separate (using appropriate liquid measures/time) and then mix it back in the pot with beans, chicken, veggies, and corn to reheat it all back up. I think if you try to cook the regular rice with chicken and veggies those will overcook. P.S. I use the salsa and chicken broth as the liquid to cook the instant rice so makes sure you don't add those in as extra if you cook yours separate. This looks absolutely delicious! I pinned it to try! This looks mouth-wateringly delicious! I had to pin it for later, too. I was not hungry. Until I came to your blog. Dangit! I know what our family will be having for dinner later this week. This looks yum! I'm going to Pin it so I keep it. I'm stopping by from BYB to say hi! This looks incredible and I am adding it to our menu plan in the next few weeks. Awesome, you'll really like it I think! OOOO that looks so yummy!! I think I might pin it to! Stopping by from BYB and am OH so glad that I did! We love Mexican food and this will be on our menu later this week! It is definitely a dish you can feel good about eating! This looks great! We were going to have tacos this week, but I think I'll end up doing something like this instead! Yummmm. Tacos are good but these are better! Great way to get in some veggies and brown rice! Looks so yummy! Definitely pinning this one! This looks delicious and easy! My family would love the flavors! Super easy and you can change it up several ways! You could try this in a crock, great idea! My family loves Mexican food. This looks delicious! Thank you for linking to the In and Out of the Kitchen Link Party. Hope to see you next time. Sounds yummy and so healthy. Thanks for sharing on Real Food Friday Blog Hop. Have a wonderful healthy day. Hi Jenny! I'm stopping in from Let's Get Real today. My family loves to throw all of our leftover taco fixings together into bowls. They always fight over the leftovers. This looks very similar. I should end the struggles and make some for all of them. Thanks for this great recipe! Hi Jenny! This looks great. My family enjoys Mexican and Tex-Me style dishes. This has all the flavors that they enjoy. Thanks for linking it to the Let's Get Real Friday Link Party. I hope you'll join us again this week. G'day! Looks very healthy indeed and definitely a recipe that would appeal to the whole family! 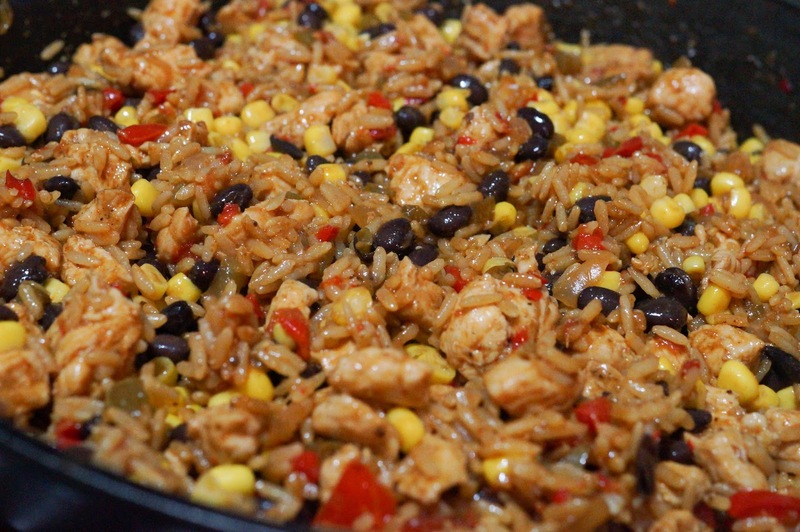 Great recipe pinned for future use, thanks for sharing on Real Food Fridays. Jenny these look great, I love anything Southwestern!